It’s almost time for our 13th annual charity shindig! Here are some event details for those who’ve never been before, and reminders for those who have. Patches are now available for pre-order! Patch orders are WILL CALL only, we don’t typically ship merchandise. If you need us to ship your order, we can do that, but please let us know via email at northtexasbrowncoats@gmail.com. Online ticket sales will cease at 10:00 pm on Sept. 22nd. Tickets will be available at the door until sold out. There will be a very limited number of t-shirts available for purchase at the event. If you miss your chance, shirts can still be ordered through Represent for the remainder of the season. This is a live event with all the potential schedule fluidity. Please allow room for delays, as we can’t be sure how long certain activities will take to complete. The movies may start a few minutes late depending on how things go, but they will not start early. *Kids get their own contests! There are no physical tickets, and there’s no need to print your receipt. There will be a check-in table in the lobby when you arrive. All you need is the name on the reservation. Unlike traditional Alamo Drafthouse screenings, there’s no assigned seating for CSTS events. However, we want you to be able to claim your seats and then roam around if you wish, so you’ll receive a little slip of paper to use as a seat saver. Once you’ve claimed your seats, it would be helpful to the Alamo staff if you’d go ahead and make contact with your server, but then you’re free to wander, leaving your seat saver to mark your spot – we’ll have a lot of shiny things to look at! Late arrivals are fine, we’ll be in the lobby to check you in until Serenity starts. After that, we’ll have a check in station inside the theater for late arrivals. That’s it folks, we’ll see you soon! **Dr. Horrible’s Sing-Along Blog” screened by permission from Time Science Blood Club, LLC. ©Time Science Blood Club, LLC. All rights reserved. Mark your calendars, we’re gearing up for our 13th annual Can’t Stop the Serenity shindig, and tickets are now on sale! This year’s event will feature Serenity and Dr. Horrible’s Sing-Along-Blog* as well as our usual lineup of games and activities, including our annual costume contest, Evil Laugh competition, and pub style trivia rounds interspersed throughout the day. Anyone with donations to bring, please drop us a line at northtexasbrowncoats@gmail.com and let us know what you’ll be bringing – it helps us out tremendously to be able to plan ahead. Anyone interested in volunteer opportunities, please give us a shout at northtexasbrowncoats@gmail.com, we’ll be having our first meeting soon. Keep flyin’! We’ll see you in a few months! *Dr. Horrible’s Sing-Along Blog” screened by permission from Time Science Blood Club, LLC. ©Time Science Blood Club, LLC. All rights reserved. This is shaping up to be one of our more interesting events – be sure and bring your selfie stick! Just a reminder that ticket sales will go offline at 10:00pm tonight, but will be available at the door starting at 12:00pm tomorrow. All of the above is true. But this post, which started out as a standard promo spiel, turned into something more personal. I don’t post as often as I’d like to in the first place, and with everything else going on in my life, I almost never talk about why I’m here. Part of the reason, obviously, is the cause itself, but that’s a different post I’ll hopefully get to later this summer. Today, I want to talk about the other reason. That’s you. This might get a bit sentimental. For anyone who’s not already aware, CSTS is entirely volunteer run. From the very top administrative levels to the newest local organizer, every hour involved in every event is donated out of love. That’s also incredible; for a fan run organization with no centralized funding to keep going for twelve years, and raise over $1,000,000 is a stunning achievement. It’s hard work though. It can be stressful and exhausting. Organizers worry about venue details, getting enough donations, sometimes getting enough attendance to even cover the rent. There are meetings to arrange, swag to designate, and complicated show schedules to figure out. Anything that goes wrong is your responsibility. * And for a non-stagey person like me, the pre-show jitters kick in about two weeks before the event. Every year during those final few weeks, I get cold feet and wonder what on Earth I’m doing, and why I keep putting myself in charge of things that scare me. That’s where you come in. The cause is the primary reason for these events, of course, and every organizer is dedicated to it or we wouldn’t be here. But I also do it, this crew does it, for the people who show up. Those devoted attendees whose names I know so well, even if I don’t know the faces because I only see them in a whirlwind once a year. The new names that show up in the ticket spreadsheet for the first time. The ones who show up in costumes and geek shirts and great big smiles, to make the magic happen. By the time the event actually rolls around, I don’t have time to be nervous anymore. I arrive in the morning with a clipboard full of notes and by the time everything is set up, it’s too late to be scared; Matt is already welcoming the first arrivals. And I realize there was never anything to worry about because this phenomenal crew knows their stuff so well. And I see all these people milling around, so excited and generous and happy to be there. And I know. It’s not just for the cause, although Equality Now is a tremendously important one. We do it because this incredible bunch of people comes back year after year, with hearts full of love and enthusiasm for Serenity and all she stands for. Your support, your trust, and your love are what have kept us in the air for twelve years, and give (some of) us the courage to keep flying. To everyone planning to attend this year, and to all those who’ve attended in the past: thank you, from the bottom of our hearts, for your support. *To everyone who attended the infamous Event Where Everything Went Wrong in 2012 and showed up again the next year: thank you. That’s what I’m talking about. To every donor and sponsor, past or present: thank you for your incredible generosity. To our current, remarkable and devoted Crew: thank you for your tireless commitment. None of these last several events would have been possible without your dedication. To my predecessors and their crews: thank you for building this event in the first place. CSTS North Texas only exists because you started it. To every Global Team member and Local Organizer who’s ever dedicated their time to making Can’t Stop the Serenity a worldwide force for equality: thank you for the boundless inspiration that CSTS has been to me. And to Equality Now: thank you for doing the real work. Can’t Stop the Serenity was my first experience with fan activism, and it’s taught me many things: all the lyrics to Dr. Horrible, still too soon for Wash jokes, you can’t stop that signal, and everybody loves a cunning hat! More importantly, it’s taught me a great deal about what I’m capable of, about what individuals can do when they come together, and about the overwhelming generosity and kindness of the geek community. Love keeps us in the air when we ought to fall down. All of us: crews, families, fandoms, and communities. Hell, maybe spaceships too. It’s certainly what keeps me going, and you are all of those things to me. Except the spaceship. You make it worth the work, worth facing down the jitters. Your happiness and support are what move my fingers in the spring when I fill out the registration form. Anyone can run a CSTS event. You’re the reason I’m still doing it. Thank you sincerely for the privilege. It’s truly an honor to be able bring those smiles to your faces. Browncoats, I salute you. And I love you guys. Mark your calendars, we’re gearing up for our 12th annual Can’t Stop the Serenity shindig, and tickets are now on sale! This year’s event will feature Serenity as well as our usual lineup of games and activities, including our annual costume contest, Evil Laugh competition, and pub style trivia rounds interspersed throughout the day. Anyone with donations to bring, please drop us a line at northtexasbrowncoats@gmail.com and let us know what you’ll be bringing – it helps us out tremendously to be able to plan ahead. Tickets and patches are available for pre-order here on our website. T-shirts can be ordered through Represent, along with our first ever official CSTS phone cases. We’ll probably do a small local shirt printing for sale at the event, but we won’t be offering separate pre-sales, and our on site selection will be limited. Represent’s full selection of sizes and colors will be available all season, but if you want to have a shirt in time to wear to the event, you’ll need to order early! Buckle up, it’s gonna be a bumpy (awesome!) ride. Online ticket sales will cease at 10:00 pm Saturday night. Tickets will be available at the door until sold out. Late arrivals are fine, we’ll be in the lobby to check you in until Serenity starts. That’s it folks, we’ll see you Sunday! The 11th annual North Texas CSTS event is just two weeks away! This year’s event will include Serenity and Doctor Horrible’s Sing-Along Blog,* as well as all of our traditional games and activities. We’ll again be holding costume contests and Evil Laugh competitions for both kids and adults, with pub style trivia rounds interspersed throughout the day. Anyone with donations to bring, please drop us a line at northtexasbrowncoats@gmail.com and let us know what you’ll be bringing – it helps us out tremendously to be able to plan ahead. Tickets will remain on sale through this website until Friday, September 23rd, and will be available again at the door provided we don’t sell out. At this time we still have plenty of room, but there’s always a rush on ticket sales during the last two weeks, so if you haven’t bought your tickets, now is the time to make sure you get them before they’re gone! Here’s this year’s schedule, very similar to last year’s schedule. Keep in mind that timing on live events is fluid and subject to change, and some things may run a bit longer than foreseen. The movies may start a few minutes late, but they will not start early. Registration will remain available for late arrivals in the lobby until Serenity begins. 100% of proceeds from North Texas Can’t Stop the Serenity events go to Equality Now, supporting the fight for human rights for women and girls all over the world. CSTS 2016 Tickets are now on sale! Tickets to the 11th annual North Texas Can’t Stop the Serenity event are now on sale! Our event this year will include all our traditional games and entertainments, including the Big Damn Movie, contests, auctions and more! It’s never too early to start painting your parasol or brushing up on your evilest laugh for our fun (and often fierce!) competitions! Kids are welcome at our family friendly event, and will have separate, kids’ only versions of the costume and Evil Laugh contests. Our new pub style trivia will also be making an encore appearance this year, so take some time this summer to marathon ALL the Whedon shows! Really, who needs an excuse to do that? T-shirts (and more!) can be pre-ordered here throughout the summer, but if you wish to have yours in time to wear to the event, your order must be placed no later than September 5th. We’re still looking into a small local print run, and there may be a few shirts available for sale at the event, but there will be no separate pre-ordering on this site. 2016 patches will be up for pre-order shortly. Stay shiny! And stay tuned for updates! Can’t Stop the serenity is changing the way we do our Global T-shirts! We’ve partnered with Represent, and for the first time ever, T-shirts are available to the general public through online sales, allowing anyone to support CSTS regardless of their proximity to an event location. Whether you can attend an event or simply want to add your support, join us as we aim to misbehave for a good cause! As you may be aware, Represent is a T-shirt printing company specializing in charity drives. They’ve been the powerful machinery behind several high profile celebrity fundraisers, including efforts by Nathan Fillion, Jared Padalecki, Felicia Day, and many others. In order to maximize the profits for Equality Now, our campaign will work a little differently than a typical short term Represent fundraiser. It will actually be a series of back to back campaigns, relaunching automatically every three weeks throughout the entire CSTS season. At the end of each three week campaign, orders will be printed and shipped, and a new campaign will begin. This will provide for continuous ordering/shipping throughout the 2016 CSTS season. 100% of T-shirt proceeds will go directly to Equality Now. This campaign is designed to reduce guesswork and upfront costs for organizers as well as eliminating event losses resulting from unsold stock and other associated expenses. It is our sincere hope that moving our T-shirt production to Represent will allow us to raise funds more effectively through their sales. We are also excited to be able to offer a much wider variety of styles and colors than we’ve ever been able to before! Please be advised: shirts may not arrive for up to 8 weeks after the order date. If you’re ordering a shirt with the intention of wearing it to your local event, please order well in advance to ensure it arrives in time. U.S. customers can anticipate receiving their merchandise approximately three weeks after the end of a campaign, international customers should add an additional week or two to anticipated shipping time, depending on location. Regardless of your event date, orders may be placed at any time. Order yours early and enjoy it all summer! Save the Date! CSTS North Texas 2016 is happening! It is official! 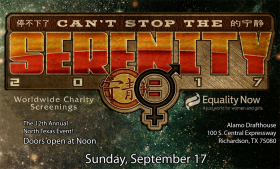 The 2016 North Texas Browncoats Can’t Stop the Serenity Charity Event is scheduled for September 25, 2016 at the Alamo Draft House in Richardson. We are also hoping to have a gathering at The Grotto in Fort Worth again this year. More details about times, when the tickets will be on sale and more coming soon!